Field umpire, Matt Stevic becomes the 21st field umpire and 40th umpire in the history of the game to officiate in 300 VFL/AFL matches. 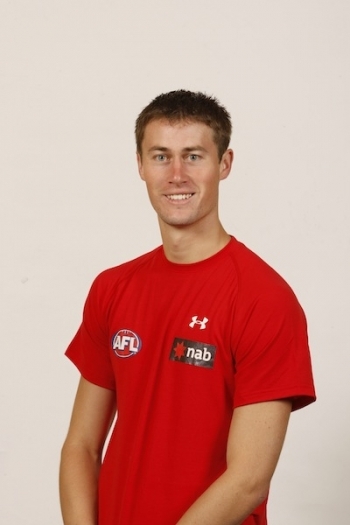 Matt commenced umpiring on the AFL panel in 2004. His games total includes 25 finals and three grand finals (2012, 2014 and 2015). Matt was All-Australian field umpire in 2012, ’14 and ’15. He represented Australia in the 2013 Ireland tour. Mitch LeFevre started his AFL career in 2008. Originally from Tasmania Mitch was recruited through the VFL. Mitch’s games tally includes 7 finals. While not included in his games tally, Mitch also umpired the 2010 and ’11 NAB cup grand finals. Mitch is the 43rd boundary umpire to reach 200 games and the 4th fastest in 8 years and 145 days. While Gerard Large had a playing career in the Essendon District League before taking up boundary umpiring. Like Mitch he commenced on the AFL list in 2008. Gerard has 2 finals in his 200 game tally. Gerard also umpired the 2013 NAB Cup grand final. Gerard reached the milestone in 8 years and 151 days. Six days slower than Mitch. Gerard of course becomes the 44th boundary umpire to reach the milestone. Courtney Lai has had an injury interrupted AFL career. Courtney was seriously injured in a collision with Liam Picken from the Western Bulldogs in round 2 of 2014 requiring a complete knee reconstruction. Courtney missed the entire 2014 season. His first match was Rd 7 2011. Courtney was the Brian Pratt medallion winner in 2011 and ’12 presented to the best first or second year goal umpire on the list. Andrew Stephens has transitioned from his home town of Brisbane and settled into life in Melbourne very well. Andrew was first listed as a rookie field umpire in 2012, coming onto the list in 2014 from Brisbane. Andrew was awarded the best or second year field umpire Medallion in 2015. 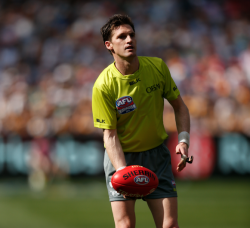 The AFL has responded to the pending retirements of two of our best ever boundary umpires this weekend when they appointed Victorian based John Morris to the Showdown in SA and brought Jonathan Creasey to Melbourne for the Carlton v Melbourne match at the MCG. Jonathan was given the opportunity to walk out onto the ground first and hold the ball aloft for the timekeepers, a task he thought he did very well and later admitted he may have missed his calling. Our field umpires continue to get injured in the most unique circumstances. Ben Ryan required a shoulder reconstruction and joins Troy Pannell in the season over category. While Scott Jeffery succumbed to a hamstring tear in the GWS v Fremantle game on Saturday. Scott was replaced by Liam Rowe who had just finished umpiring the curtain raiser match. Ironically, Scott was walking around better on Sunday than Liam was after umpiring 6 quarters of football. Liam becomes the 116th known replacement umpire and it is the fourth time in Scott’s career he has been replaced in a game.